Hey everyone! I am very excited to be doing a guest post on Amy’s lovely blog… we have known each other for a few years, so it’s so nice to be sharing on each other’s blogs. 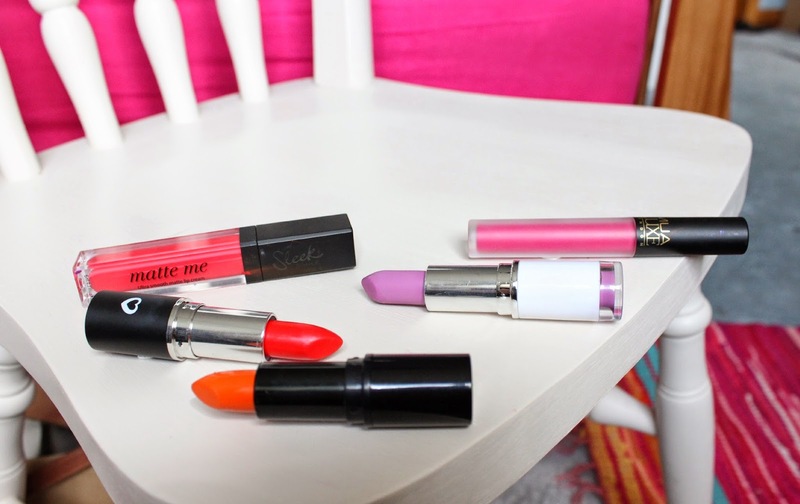 Today I thought I’d write about my 5 top drugstore picks for bright summer lipsticks. For bright lips I am a big fan of the matte finish – I think it looks really good, and it’s pretty low maintenance. The mattest of the bunch is Sleek matte me in party pink. Once you master the slightly-tricky applicator this applies insanely pigmented colour that lasts for about 5 hours. Another liquid lipstick I particularly enjoy is the MUA luxe velvet lip lacquer in funk. This is a seriously bright pink that manages to brighten your complexion. Be careful with this one though – you need to prep your lips as any dry patches or lines will be really visible. If you’re into all things purple like me, you’ll want to check out the MUA lipstick in lilac Belle. This is really similar to the MAC Dodgy girl lipstick from the Kelly Osbourne collections, but only £1! Madness. Two more orangey ones… the Beauty UK lipstick in naughty is one of all time drugstore finds. It is amazing – a little bit of pink, red, coral and orange. Lastly, the Make up revolution lipstick in Vice is a straight up orange that I think will look amazing all summer long. So… those are my picks! I hope you enjoyed. Thank you to Amy for letting me post! Thank you Laura for posting on my blog today, you can visit Laura's blog here and don't forget to check out my post on her blog!